CRYPTO: Can Stablecoins jumpstart the digital economy? We are bummed with the SEC's rejection of pretty much every effort to launch a Bitcoin ETF, which is at the top of the wish-list for normalizing crypto currencies and assets. The investment management value chain is now caught in a weird race: (1) either crypto custody will become regulated and build tendrils to plug into existing infrastructure, or (2) a regulated wrapper, like an ETF, must contain underlying crypto assets, and then travel along into asset allocations of regular investors. Neither is going to change the mood of the market tomorrow. So instead of focusing on financial progress, could the crypto economy show some economic progress? A recurring thesis for spurring on that economic activity, supported by continued investment from crypto funds and ICOs, is the emergence of stablecoins. The argument goes that if you have a virtual currency that stays pegged to the US dollar, for example, then the currency can be used to buy and sell goods without the fear of volatility (or capital gains on buying a sandwich). It can also work as a unit of account in which other assets are traded. And if we can figure out how to dampen volatility in the markets, perhaps that will also be seen as a positive by the SEC. A lot of ink has been spilled on how different projects are different -- but at the core, this is an automated macro banking algorithm that must maintain price parity, backed by assets, leverage, or fraud. One that can be manipulated or broken (e.g. below, Nubits). We see stablecoins as incrementally helpful, but not sufficient. You still need a fiat/crypto equilibrium mechanism, and if a stablecoin becomes large enough to maintain a digital economy, it comes into direct competition with the United States government, its monetary policy, and its police force. It is highly unlikely that the US will let a decentralized or private actor print the equivalent of dollars. Who knows, maybe a central bank issued coin is still a reality -- take for example,Thailand, which is working with R3 on interbank transfers. While this isn't what most Bitcoin enthusiasts would want, the USD is the best peg to USD. Let's just get people to hold it in a Bitcoin wallet -- which is why rounding your change into crypto using Revolut, or getting a blockchain-native phone once it's out, could be so meaningful. Convergent evolution in nature is a fascinating phenomenon. Organisms that have entirely different histories can develop similar solutions to a recurring problem in the environment. For example, take the flight skills of birds and bats, or the eyes of mammals and cephalopods. Natural selection has a way of chiseling away at wetware until we get a serviceable answer. In a similar vein, we expect to see similar governance outcomes in the traditional financial services industry and the crypto economy. And we don’t mean the vanilla stuff, like the regulator presence, or industry boards that create standards. Instead, we are pointing to two different phenomena that should have the same effect: (1) the Dodd Frank legislation requiring capital standards from banks (and especially the FSB rules for Globally Significant Banks), and (2) the steady move in several public blockchains towards Proof of Stake. Let’s back up. In traditional finance, sentiment and impression of financial stability is key to the functioning of the system. The simple reason is that banks are massively levered, especially when involved in capital markets activities, like trading and investment banking. And even in the case of the depository bank, the bank lends out the deposits it collects from clients. A run on the bank occurs when all the clients try to pull funds out at the same time, learning that the funds aren’t there, and causing further panic. Thus things like government insurance (FDIC). And in complicated cases like 2008, the run was on the banks by the banks themselves. When Wall Street thought Lehman couldn’t pay its overnight commercial paper because it was insolvent, credit dried up. And so did Lehman. Which brings us to capital requirements. In brief, this is a regulation that forces financial institutions to hold a certain amount of assets on its books, rather than circulating out there in the markets earning a return. Instead of being 30x levered, you may only do 15x or 20x, depending on how important you are and what assets you hold. Having cash on the books is better than a bunch of junk bonds, and so on. When a confidence crisis happens, the institution – so goes the theory – will have enough buffer to absorb a shock, and no government insurance is needed. In the abstract, that means that today’s banks all hold assets in order to participate in the financial system as players (and take their economic rents). But remember the refrain – banks supposedly manufacture trust, trust in the economic system, in the presence of cash, in payments, in commerce. This capital is the government’s (and if we believe in effective representative democracy, it is our) way of putting institutional “skin in the game”, which scales with importance to the industry. If you know your crypto consensus mechanisms, you may know where we are going. 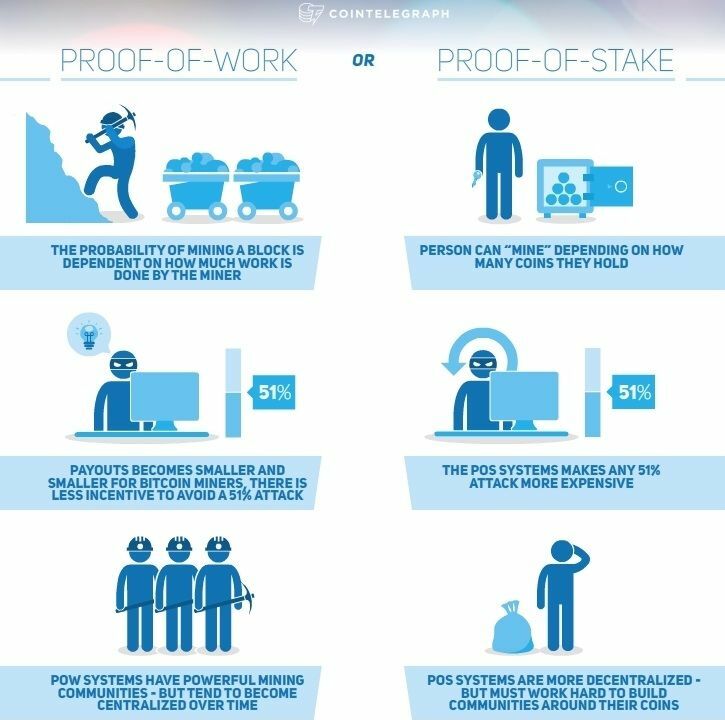 Today’s Bitcoin and Ethereum chains are secured by a computationally expensive method called “Proof of Work”, where the “Work” is the burning of electricity to power processors good at solving arbitrary math. Various groups are unhappy with this power consumption, and the centralization of mining power it has caused whispered complaints. Different consensus algorithms exist, as do controversies about them. But generally speaking, approaches like Proof of Stake, or EOS’ Delegated Proof of Stake, will work of crypto resources instead of physical ones. Your “stake” is the capital you hold, that may be committed to participating in the system and manufacturing trust, through voting or forging or something else depending on the project. Built into the economics of committing such capital to validate blocks is a probabilistic rewards, which looks a lot like interest on average. What this means is that crypto and banking have converged on the same solution. Some central authority declares the guidelines of the system, and how much capital is required to be committed to keep it humming along. Then, parties that manufacture trust put this capital aside as table stakes to be in the rent-taking business. And, by the nature of the beast, scale efficiencies of running such operations lead to consolidation and some form of global oligopoly A large bank today may find such a system to be pretty familiar and comfortable – and they certainly have the capital to deploy. Goodbye crypto utopia! With public crypto funding at $700 million in November alone, it is easy to forget that anything else matters. But let's check in on the progress of sovereigns and incumbents in capturing and controlling blockchain technology. Take for example, the Australian Stock Exchange working with Digital Asset Holdings ($115 million in venture raised) on replacing the entire trading chassis with a proprietary "Distributed Ledger Technology", i.e., a private blockchain with the attributes of confidentiality and scalability. ASX is moving forward with DLT as a production system, which is a big deal. For context, the sum of market capitalizations on ASX is $1.5 trillion, or 3 to 5 times larger than all of crypto. Which of course raises the question of how private and public chains will interact. For that, see Aion, Polkadot, Blocknet, Wanchain, and various others. Another development is the growing progress towards sovereign digital currency. Certainly the US Federal Reserve is flirting with the idea, especially after Russia has indicated strong interest in building the crypto ruble. Also surprising is the news that Venezuela, famous for putting people in jail for Bitcoin mining, is going to launch its own cryptocurrency. The planned offering sounds like an ICO of the country's national resources. If you can't beat them, join them. The silliest data point we've seen is this. Bulgaria, a country with a $60 billion GDP and $16 billion of national debt realized it owns on $3 billion of Bitcoin, which was seized in a law enforcement action earlier in the year. 5% accidental GDP growth (or 20% national debt repayment) is nothing to sneeze at. Will Bulgaria go long BTC or hedge out some of that risk using CME futures? Or, manipulate public opinion with some soverign propaganda bots to impact the price?